We’d love your help. Let us know what’s wrong with this preview of Firestone Key by Caroline Noe. But when the fading vortex inexplicably bursts into life, Elaine is blasted into a medieval society that bears no relation to What power would you use to make it right? To ask other readers questions about Firestone Key, please sign up. It’s been a while since I’ve read science fiction and I was looking forward to this immensely, having heard nothing but good things about it. However, I would quibble about the genre it’s been placed in, to me the book fits more neatly in a fantasy bracket, as it’s not set in space or the future, there aren’t any aliens involved, and it’s not heavy on the science side. Instead, it’s the story of brilliant loner Elaine. Abused by her father and with a miserable childhood behind her, she’s headhun It’s been a while since I’ve read science fiction and I was looking forward to this immensely, having heard nothing but good things about it. However, I would quibble about the genre it’s been placed in, to me the book fits more neatly in a fantasy bracket, as it’s not set in space or the future, there aren’t any aliens involved, and it’s not heavy on the science side. Instead, it’s the story of brilliant loner Elaine. Abused by her father and with a miserable childhood behind her, she’s headhunted into a research facility for the highly intelligent, along with her only two friends from university. There they embark on a mission to invent time travel, little realising a novelty pendant Elaine has owned since childhood holds the answer to what they are looking for. A freak accident sends Elaine spinning through time to another era where she is accused of witchcraft and literally has to run for her life. The opening chapters of the book set in modern times were sparsely written, with the author not wasting any words unnecessarily, and there was the sense this was just a precursor to the main plot, almost a prologue, and that the stage was being set as quickly and economically as possible. Once Elaine has time tripped, the style and pace of writing changes taking on a more descriptive tone and it’s then one feels the author really relaxes into her story and starts to enjoy herself. The characters that Elaine meets are an eclectic and quirky mix of oppressed and oppressors, living in an apparently feudal system ripe with forbidden magic. The author even invents a dialect for these people, which took me a few pages to pick up but then it clicked with me and I found it a nice, authentic touch. There was so much I liked about this book and only one thing that jarred very slightly, the pace was headlong, full on, for the whole book and I desperately wanted things to slow down every now and then to give me time to catch my breath. Personally, I found it just a little too intensely fast all the time and I feel the odd respite, maybe a paragraph or so of reflectiveness would have added balance to the book. However, this is only my personal opinion and in no way detracts from the very solid five stars I’m awarding it. This book is fast and funny, and I enjoyed it immensely, so much so that I have already bought another book by the same author. I really enjoyed this read but a very talented author. It has time travel, magic and great characterisation. The story plots well and has a strong female lead character who is very easy to root for. Definitely worth a read! I really enjoyed this book. A bit out of my comfort zone, as far as the genre goes, but I'm really glad I gave it a go. It features some of my favourite characters that I've come across for a long time. Including Drevel the farting but lovable dog, and Melith, the amazing woman who made me think of that friend's mum that everyone knows in school. that everyone is slightly afraid of but also really wants to impress! I won't go into the other characters as I don't want to give too much away, but le I really enjoyed this book. A bit out of my comfort zone, as far as the genre goes, but I'm really glad I gave it a go. It features some of my favourite characters that I've come across for a long time. Including Drevel the farting but lovable dog, and Melith, the amazing woman who made me think of that friend's mum that everyone knows in school. that everyone is slightly afraid of but also really wants to impress! I won't go into the other characters as I don't want to give too much away, but lets just say I kept changing my mind about who I liked and trusted the whole way through! And felt awful when I was wrong about one of them. There are so many twists and turns with this one, it is really unpredictable, right until the end. I'd definitely recommend it, whether or not fantasy is your usual style! Firestone Key was complex and creative. Full of twists and turns, it will keep the reader guessing. I found the transition between the present and past jarring and the language a bit of a challenge, but the author has created a cast of unique characters and a compelling storyline that comes to a startling ending. At the heart of the story are the amazingly real characters Noe built. I adore that none of them – not one – are completely good or completely evil. At any given time, the characters you’ve grown to love can do something that makes you cringe. You understand, on some level, how the characters you’ve grown to despise became who they are. Noe’s writing style is just descriptive enough to give you a clear view of the world, the people and their actions but not so descriptive that you get pulled from the story. Her use of a different dialect to indicate a jump in time was absolutely amazing. The amount of care and thought that went into that part of her story shone through. It was just different enough to be noticeable but not so different you spent the majority of the book trying to understand the characters. Mostly I love that it was more than just a story. It was a discussion about cause and effect – how our actions can sometimes cause the very things we are trying to prevent. How frail and strong, all at the same time, the human connection can be. It was a discussion about love, hate, addiction, pain, suffering, redemption, friendship, family, strength, weakness, fear, and bravery all wrapped up in a sometimes funny, sometimes heartbreaking, time-traveling, magical tale. I can’t wait to read more from Noe. I really enjoyed this story. It was well written, nicely paced and so very intriguing. The characters I thoroughly got swept up in, particularly Elaine. The themes of time travel and consequence are one of my favourite themes in fantasy literature and the author did it uniquely. Excellent read, would highly recommend. A mixture of time travel and fantasy, this was a very good read. It started a little slow but as each chapter unfolded the plot became more and more fascinating. The main character in particular was very appealing. Her growth as she adapts to the situation she finds herself in, is endearing, and cements a strong female role model. The use of language in conversations, altered to the demands of the new world was clever and believable. The world-building itself was complex, and flowed easily so suspension of disbelief was an easy ask of the reader. This is a lovely offering from a new author and one well worth experiencing if you want something different, something fresh and something full of adventures, wonderful characters, a little romance, and a lot of humour. Noe really does a great job of introducing the tormented introvert 12 year-old Elaine and the 13 year-old leggy twins Neil and Leila. Four years at the academy for gifted children pass and the trio is still inseparable. When the genius Leila is given free rein to go in whatever direction she wants she drags her brother and best friend along; another six years pass before the world is in crisis and The Project takes shape. Her transportation back in time is well written and the new land she is th Noe really does a great job of introducing the tormented introvert 12 year-old Elaine and the 13 year-old leggy twins Neil and Leila. Four years at the academy for gifted children pass and the trio is still inseparable. When the genius Leila is given free rein to go in whatever direction she wants she drags her brother and best friend along; another six years pass before the world is in crisis and The Project takes shape. Her transportation back in time is well written and the new land she is thrown into along with the characters she encounters is richly described. The author’s synopsis being as good as any review I could write. The final showdown...well let's just say it doesn't put everything right. There's enough in this book to give every fantasy lover a great read, classic time travel, good against evil battles, fire-breathing creatures, friendships and loved ones lost. It’s big and heavy with characters speaking with dialect but I happily plodded through it and loved it! As a side note, I think they should put a sequined tutu on the T-Rex in Jurassic Park. I rather enjoyed Firestone Key. Caroline has created a cast of characters, who are all distinct and clearly identifiable, I also enjoyed their dialect a lot. There are a lot of good ideas and plot twists and the story is full of humour. 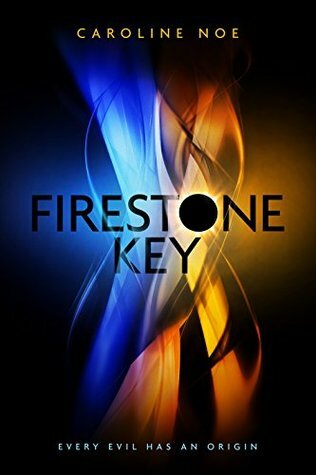 To be honest, I was wavering between three and four stars for Firestone Key, and I think with an edit it would have been an easy four. For me, part one of the book read a little awkwardly, and in places I struggled to understand what was happening, until I started I rather enjoyed Firestone Key. Caroline has created a cast of characters, who are all distinct and clearly identifiable, I also enjoyed their dialect a lot. There are a lot of good ideas and plot twists and the story is full of humour. For me, part one of the book read a little awkwardly, and in places I struggled to understand what was happening, until I started thinking more visually, as if I was watching a film, and then suddenly a lot of the perceived awkwardness made sense. Much of the humour (which in places had me chuckling out loud, and there aren’t many books I can say that about!) especially benefitted from this approach. Because of this, I think that what Firestone Key really needs is an edit. There are a lot of good ideas in this story that just need a little editing to bring them out. Catherine has a great imagination, and good sense of humour both of which would shine through after an edit. That said, part two read much better for me. I enjoyed Caroline’s characters, but I did sometimes struggle to experience what they were feeling, and therefore did not bond with the main characters as much as I could have. I think this is somewhere else that an edit would help. The author nearly lost me in the first few chapters of the book. For me, the beginning was chaotic, not smoothly enough to be an easy read. The use of the language in the other world was clever, but I had to get used to it. Having said that, after a few chapters the story became very interesting, and the characters all had a good and a bad side, which is a good thing. There are a lot of characters who I loved. The story is complex, has humour, time-travel, hate, love, and in this world a mistake The author nearly lost me in the first few chapters of the book. For me, the beginning was chaotic, not smoothly enough to be an easy read. The use of the language in the other world was clever, but I had to get used to it. Having said that, after a few chapters the story became very interesting, and the characters all had a good and a bad side, which is a good thing. There are a lot of characters who I loved. The story is complex, has humour, time-travel, hate, love, and in this world a mistakes can be made easily by the characters, which makes them believable, and they pay a hefty prize. Caroline has written a complex but magical story. Once you are sucked in, it takes you places you have never been before! Firestone Key is intriguing and clever, and I found myself intoxicated by the storyline of this time-travelling, save-the-world speculative fiction novel. Caroline is an outstanding author of detailed sci-fi/ fantasy novels. Her writing is captivating and engaging, drawing the reader in with descriptive and exciting prose. I thoroughly enjoyed this book. It was a great storyline and kept me interested to the very last page. I'd definitely recommend it.